La Jonquera - Algeciras: About 1400 km.. the last in the European territory.. a bit catastrophic, but very very lucky.. spending very much time -without being in our plans- for relaxing before entering on the African continent.. curious about the next step but eager to explore the "black continent"..
Saturday afternoon, we arrived in Barcelona after a quick pass from France. None of us had visited before the capital of Catalonia and it was another desirable destination. With 1.6 million people, Barcelona is the second largest city compared to the capital, Madrid and in general it is a very popular travel destination, especially for weekends. Being too much crowded because of the Formula 1 Grand Prix, Barcelona is a very beautiful city with a very high standard of living, incredible layout, huge avenues, full of tapas-bars, sight seeings and attractions. After settling in a miserable hostel (Hostal Morma) just above the parked Zikos, we dinned with authentic paella and sangria, we walked to the seaside, danced like crazy in a live concert that we found by luck and ended up in La Rambla, the famous pedestrian street of 1.2 km. Saturday night, the city was full of locals, tourists, street artists, kiosks with souvenirs, restaurants, bars and clubs. As already known, next morning, we woke up by two Spanish policemen, who had saved Zikos and our most precious belongings from theft. Being so lucky, we did not waste time and started visiting the most worth-visiting sites of the city. What is more, we were double lucky to park the car inside the garage and so we managed to get rid of a car with a broken window. Not to mention that the garage was just opposite Sagrada Familia, an unfinished yet state-of-the-art sightseeing made by Gaudi. Georgia was always dreaming of visit Barcelona only to see and admire the works of Antoni Gaudi, the most famous Catalan modernist who filled the entire city with his masterpieces. Sagrada Familia, Park Güell, La Pedrera and Casa Batlló. Some of the most emblematic works of the Catalan architect you should not miss if you ever visit the city. We spent the rest of the day in McDonalds, the cheapest burger for 1 euro and free wifi. We found another -less miserable than the previous one- hostel (Hostal Muntaner) to get some rest. 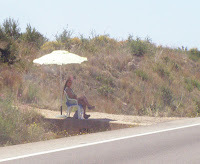 It is a pity that in Barcelona and the entire area, you cannot find any camping site to stay (as in Italy). On the other hand, we found countless hostels that were all booked because of the Formula 1 race. But honestly, we cannot understand why someone would prefer to spend on average 25 euros per person by staying in a hostel, instead of giving a little more in order to can stay in a hotel and so having its own room, bathroom and of course breakfast. On Monday morning we visited the temple of FC Barcelona, the famous Camp Nou. Of course, we did not pay 22 euros to visit the museum and the inside part of the stadium. We are pretty sure that people in the football club are more capable of Greek politicians in handling the status of the team along with the financial thing and so they do not need the money of tourists. We only took a walk around the Camp Nou and the store that was enough for two travelers who had their car in the garage. In the afternoon, we got the brand new Zikos back and we moved southern to Tarragona. Because of the time and the redefined budget, we "camped" in another Service Station somewhere outside Taragona. The day after, we drove 440km up to Alicante, a very popular destination especially for English people with the travel packages starting from 400 euros for a 7-day hangover in Costa Del Sol. A short walk in the seaside, some photos and two awful ice creams (True fact: you can only enjoy really good ice cream in Italy.) were enough for us, as we had to find another Service Station to relax. Traveling to south Spain, you cannot miss Andalucia. GPS sent us through Granada that was closer to the port of Algeciras, so we decided to go for it. We were lucky enough to find a small family camping (Maria Eugenia) with all the facilities and unlimited free wifi, just 10 minutes away from the city center. So, we decided to sit there for a while to do the laundry, upload our stories, photos and videos, recharge our batteries and then go straight to Morocco. BUT.. Always there is a "but". Leaving from Greece, we had a minor issue with the winch to be out of order that had to be fixed before moving to Africa. So, we had to wait for the spare to be received in the camping. Thanks to the VitaraClub people, the dealer of the winch sent the spare initially in Italy. But because it took more time than we could spent, we decided to move on and receive it somewhere else (with the help of our friend Akis Temperidis who forwarded the parcel). So we choose to be in Granada. We were lucky to find this camping that was very cheap (11,60 euro per day), the city had so many worth-visit sights and the port of Algeciras was only 3 hours away. All in all we became tourists in Granada, a city where the famous poet Federico Garcia Lorca studied, succeeded and eventually being murdered. In Granada, the visitor can find two UNESCO World Heritage Sites. La Alhambra (plus Generalife) is a palace and fortress complex and it is the most renowned building of the Andalusian Islamic historical legacy. Along with the district of Albayzín that retains the narrow winding streets of the Medieval Moorish past, make Granada an excellent travel destination as long as you visit the autonomous community of Andalucia. Sculptured gardens full of roses and cypress trees, Islamic-art fountains, walkpaths through history, ancient monuments and watchtowers form the "red fortress" where you need officialy -as stated in the guide- on average 3 hours to visit it. In the Albayzín districts and especially on the hill of St. Nicholas church, you can admire the cidatel from a long distance and get some nice photos as well. If you decide to go further, you end up in Sacromonte, an old Gypsies neighborhood that offers a panoramic view of the city with the Alhambra palace to be on your left and Albayzín district on your right. To sum up, the whole area reminds you bits of Moroccan or Moorish neighborhoods as the Islamic-Arabic impact is everywhere. What is more, in our long stay to Granada, we were lucky enough to see the city's celebrations for the El Rocio Pilgrimage. Every late May, all cities and villages in Andalucia are full of covered wagons, awesome Andalucian horses and traditional Andalucian clothing -broad brimmed hats and traje corto for men and flamenco dresses for women. All the people head off to the El Rocio village while carrying their own virgin. We saw the whole city full of Western style wagons decorated with colorful flowers pulled by tractors, tens of men on horseback and two bulls to pull a silver cart with a replica of the Virgin. At the end, all the pilgrims travel to the town of El Rocio, in the Huelva province where they spend a pilgrimage weekend. There are also parties, horce-races and a number of competitions. All the people sing and dance at all hours of the day and night until the early hours of Pentecost Monday when the Virgin is brought out of the church. The guilty stuff has been removed! After all, we received the winch spare. We fitted it with the help of a Spanish guy who just arrived in the camping, the winch worked again and after spending 12 nights in Granada, we were ready to move to Algeciras. On Tuesday the 29th, we sailed to Ceuta, a Spanish and Moroccan enclave in North Africa. On our way to Algeciras, we crossed the famous Costa Del Sol or Costa Del Golf, as the local authorities like to present the whole area because of the amazing number of Golf Clubs that have been built for tourists. Marbella and Fuengirola, the most notable cities are full of resorts, huge commercial centers and terrific restaurants. The ideal place for a tourist.. you think so? Stay tuned. We are getting in Africa! We liked: We drunk 8 beers and ate 4 tapas-plates for 13.5 euros (tapas: Spanish snacks that come with your drink∙ especially in Andalucia are served free), the fact that the A7 motorway (Autovia Del Mediterraneo) is a new modern highway without tolls, the masterpieces of Gaudi, the camping Maria Eugenia in Granada (Great Camping - Great People - Great Discount - Many thanks!!). 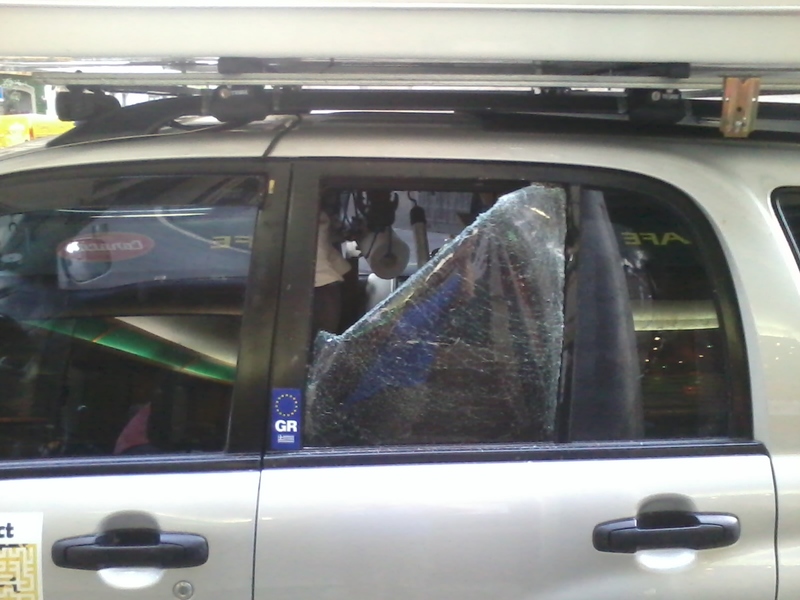 We did not like: The broken rear window of Zikos, Spanish truck drivers who run like crazy and the very expensive capital of Catalonia (2 euros for a bottle of water 0.5lt or a soft drink or a sticker-souvenir for Zikos, 22 euros to visit Camp Nou Museum, etc), no English at all in any label, sign or direction and very few Spanish people who could speak English. We saw: Full of citrus-trees lands throughout eastern Spain along the Autovia del Mediterraneo, wide one-way highways with 7 lanes within the Barcelona city center, ​​authentic Gitanes in Albayzín, outside St. Nicholas church and -once again- prostitutes along the road to Valencia under their umbrellas. 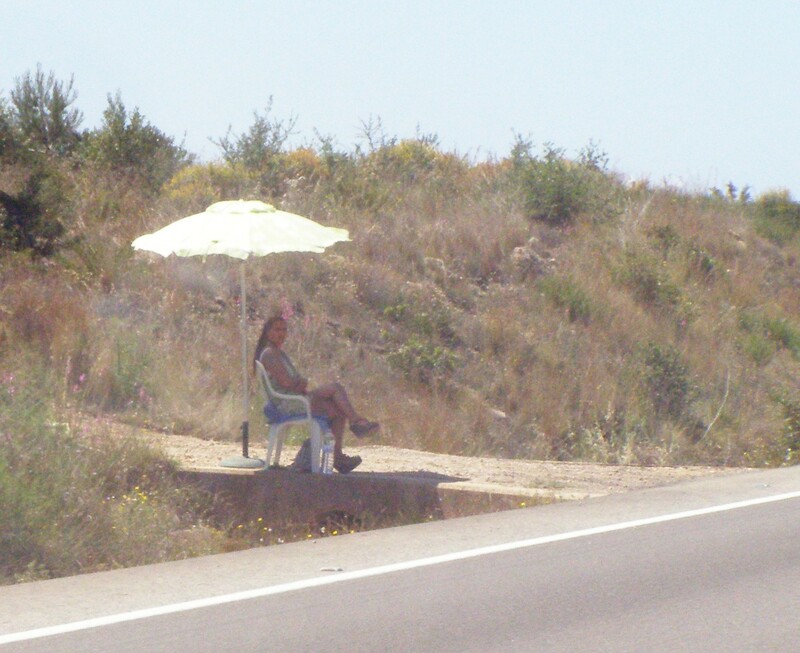 Driving in Spain: As mentioned above, whatever route you take and whatever network you use, it's a pleasure. A lot of congratulations to Spanish that built a modern highway like Autovia Del Mediterraneo (A7) without tolls. Attention: Note that the motorway AP7 (Autopista del Mediterraneo) from the French borders to Gibraltar has tolls. Spanish drivers are not the best drivers in the world as they have no idea about indication lights. Like in Italy and France, a huge number of roundabouts replace traffic lights and make your life easier. In any case, the indicator lights are a must any time you exit from a roundabout. Average price for diesel 1.28 euros. 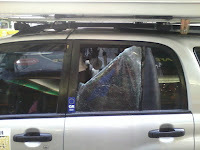 Car: Apart from the broken rear window that is the only one without the black protective film, Zikos did it just fine. As our speed did not exceed 80-90 km/hour, we saw the consumption to fall into 9,4 lt/100 km and we managed to cover 700 km route with a full tank. On the whole, we covered 3.568km within the European territory, consumed about 300lt of diesel and our GPS unit Mio Moov 560 turned to be a great device that traveled us in Europe in the most accurate way. © The Pin Project 2011. All Rights Reserved. Unauthorised use of images or text is prohibited. Powered by Blogger.